Before we welcome and usher the year 2015, I'd like to look back a bit (still on the process of trying to move on from this year's traumatic experience which my family and I had encountered) to thank God and all the other people who had shown their love, care and support to me and my family in one of the most crucial years of our lives that has happened in 2014. I will forever be grateful to you all for helping me in one way or another during those times when I felt the world would crumble before me. Words may not be enough to thank you for the effort you guys had shown me and my family, but I pray each and every night to give you more blessings from up above. 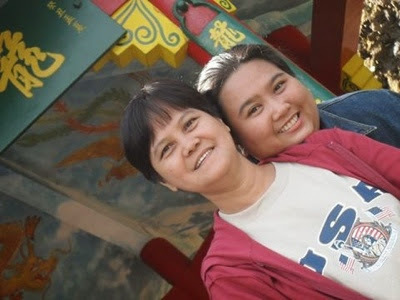 My Mom and I during our trip to Baguio two years ago. 1. I am very happy and so grateful that my Mom and I are still together. We almost lost each other during that ATV accident we've had at an extreme adventure park in Porac exit, Pampanga last April 5 before its was even made open to the public. It was the darkest moment of our lives. I swear, I had to held on to my faith. Otherwise, I would've gone totally ballistic as I was on the brink of losing my emotional sanity. Seeing my mom in such a vegetative state after she had fractured her femur (the longest bone we people have) from the accident made me depressed. 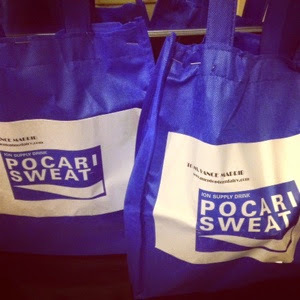 My Mom used to lead a very active lifestyle--she would even dance zumba, play a mean badminton game, do taebo or run. But all these things began to change after the said accident. She could no longer do such and will be using a cane for the rest of her life to help support her walking. In fact, because of this accident, she became a PWD (person with disability). Mom also had her own share of fears and tears, but I told her that we're in this together--that come what may, I will never let go of her hand until she asks me to. As of this writing, we're still trying to move on and get back on the right track. I kept reminding her that although it's really very difficult to do so, we should look at things in a positive way. What matters is that she can now walk although in the vernacular we refer it as "pilay". I am thankful that her brain though a bit damaged (she had suffered a mild stroke during the accident) did not affected her much. I am also thankful that I am fine--despite being literally thrown under the ATV--it had spared my spine. I could've broken my spinal cord but I am so thankful I did not. Aside from bruises, cuts, hematoma and temporary discomfort on my back, arms and lumbar--I'd like to think I'm spared from any serious infliction. 2. That same accident last summer also made me see life in the bigger picture. I became more responsible for every action and decisions that I make. I used to think what I knew was enough, but all the things that has happened had taught me to face more complex and complicated problems which in the process had given me maturity in life's all aspects. During those trying times, I was surprised at myself on seeing how composed I was. Maybe it had something to do with circumstances, after all, I practically had nobody else to rely on. I had to do what I had to do, I didn't want to let my mom down. At the time, I was her only source of strength. Of course, there were actually times where I was at a point of breakdown, but I was able to muster all the courage I had. My only consolation was knowing I had been tough. All my life my mom was my anchor, little did I know na kaya ko rin naman pala maging tough on my own. Let each moment count. 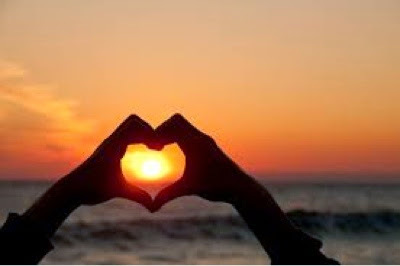 Tell your loved ones how much you love them and show it to each of them while they're still there to appreciate that love. 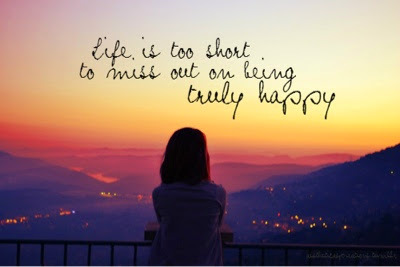 Life is too short, make good and lasting memories with them while you can. 3. This blog article isn't all about the accident though, but I just wouldn't want to end this year without thanking all the people who had helped us to gain our lives back. I feel am so blessed to have the most generous, kind, and caring twins in the world: my best friend Abby and her equally smart twin Aileen Baino, the entire Mayuga-Baino family who treats me as if I'm a relative: Tita Titen, Tito Tom, Tita Yna, Erwin + Kuya Efren (their family driver) and Ate Vilma (their household help). I wish to thank the lovely and petite Ms. Leony Garcia who had never left my side during such ordeal. She's like my second mother. Thank you for everything you've shared with me and for just being there all the time. Thank you to the huge blogging community who had shown their support and concern: Ms. Janette Toral, one of the pioneers in blogging, Jonel Uy and his wife Marjorie Pineda-Uy for being the first ones who really took time to visit my Mom at the Philippine Orthopedic Hospital, fellow mommy bloggers Corrine Emata, Erica Yu-Bonifacio and Lariza Garcia, lifestyle bloggers Rey Esteves (thank you for making me laugh at the time I needed it the most), Alice Mate, Richard Mamuyac, Daryll Villena, Ia Adam Lim, Jenny Roxas, my high school best buddy Melanie Matundan-Malapad who did not think twice about visiting my Mom and even brought huge tetra packs of calcium fortified milk for Mommy, my college classmate Tita Galicinao, my former blog representative Norma Galera, Christian Melanie Lee who constantly checks on my Mom's condition at the time + to all the other bloggers who helped even by simply spreading the news about us in order to reach the ones who are responsible for it and those who prayed for my mom's safety during the operation. I wish I could mention you all on this article, but since I couldn't, God knows who you are. I pray that you will be blessed more. I also wish to thank the PR mavens with pure HEARTS: my good friends Sirikit Gavino and Nana Nadal, Havas PR Agatep's Ice Antonio, Penser Q's Ms. Ana Liza Reyes-Bautista and StratWorks' gem Ms. Ginny Guanco. You guys are just few of the most genuine pr I've known. Sana lahat na lang ng pr katulad ninyo, hindi gaya ng iba diyan na saksakan ng plastic at puro kaperahan lang ang alam. I also wish to thank my Mom's classmates and batchmates at J. P. Laurel High batch '74, particularly Tito Billy Temblor (who was the first one to respond when I was asking for blood donations), Tita Lourdes Montalvo-Martin and Tita Grace who really thought about the things that they should bring when they've visited Mom at World Citi Hospital. I was amazed you knew exactly what Mom needed at the time. Thanks to Tita Chona Osero for making my Mom laugh with all your 10 shots, you brought the gloomy hospital room some fun time. To Tita Yette and her twin, to Tito Jaime, Tita Agnes Diuco-Caluya, Tita Poknet De Castro, To Ms. Cecile Icabales and company, thank you for all the prayers and the visit. Thank you to our neighbors: Ms. Alice Faraon, my Mom's elementary teacher, Mrs. Fernandez and her daughter Baby Balog for the visit. To my mom's physical therapist whose efforts on his work may qualify him to build a monument of his own, Sir Marvin Tolentino. Thank you for making my mom walk again. To her doctors: World Citi Hospital orthopedic/surgeon Dr. Ronnie Filart, general surgeon Dr. Petrocino Pascual, cardiologist Dr. Rey Alvarez and mom's rehab doctor Dr. Josephine Bondoc. 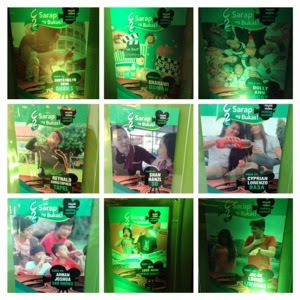 Thank you to Ayala Land (Alviera/Sandbox) for helping us financially. 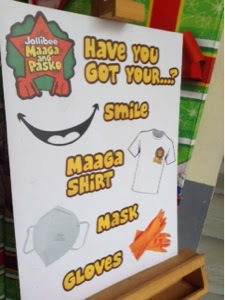 Sana wala nang aksidente ulit na mangyari sa adventure theme park nyo gaya ng sinapit namin. Thank you to Ms. Joy Sansiangco and most especially to Ms. Emma Edrada--dahil sayo naramdaman ko na kahit paano may isang taga-Ayala Land na naging tunay na concerned sa amin. Salamat at hindi mo kami pinabayaan. 4. I thank God for the gift of friendship. The year 2014 made me realized who my real friends were. I was able to gain a couple of new friends (I only have a few but those are the kind I am certain I'll be having for keeps) too. I've met Melanie Medrano, Cheryl Luis and Dems Angeles. They are sort of 'angels' to me, in one way or another. There are actually a lot more people I've met this year who I am thankful for--like Ms. Teng Tobillo --and a whole lot more! 5. I thank God that Kyle was able to finish with grade school. It wasn't exactly a walk in the park, but at least he was able to breeze through it. I am also glad that he was able to learn how to play the guitar and I had to thank Sheryl Reyes for that. If it hadn't been for her sponsored acoustic guitar, Kyle won't be able to learn well. I'm proud to say that he can now play Eraserheads' Ang Huling El Bimbo, Goo Goo Dolls' Iris and a whole lot more. Kyle took his lessons to heart and he had enjoyed playing the guitar so well. I just hope he feels the same way to his academic studies. Oh, well, but then again, that's another totally different story. 6. I am thankful that I was able to close an ex-deal. Some of my friends know about what I am talking about. I won't give the details anymore but the actual cost of that ex-deal is roughly Php25-27k! And because it was through an ex-deal, I may not have gained a single cent out of it, but surely it was worth it. 7. We are thankful for the comfort of a new bed. 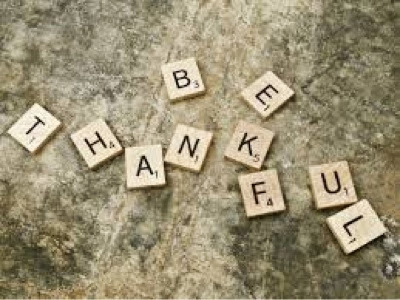 Of course, I am thankful for having a shelter above my head, electricity, wifi connectivity and cable TV at home. But I am so grateful for our bed. 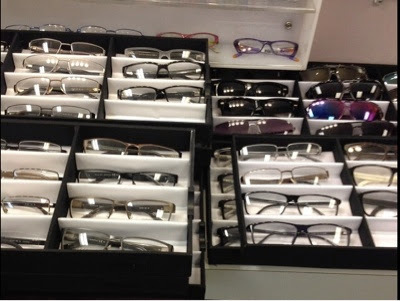 It takes away all the stress and makes me sleep comfortably as I get ready for a new day. 8. 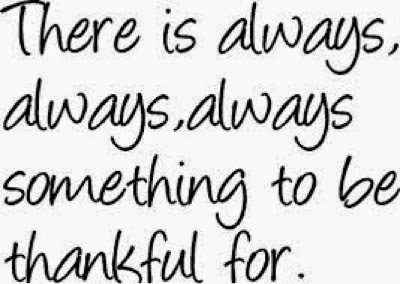 I am thankful for the simple reason that for every door that closes in my life, another one opens. Life is indeed like a present waiting to be opened. It's packed with much surprises each day. 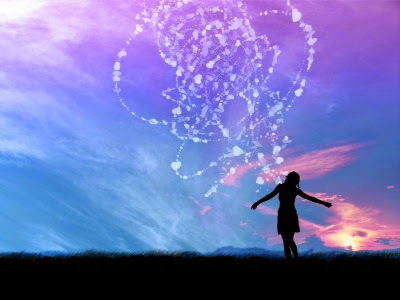 I believe that whatever good or bad things that may have happened and might be happening in the future, it's meant for a deeper reason or purpose. 9. I thank the good Lord that despite of all the natural calamities our dear country had faced, Filipinos have remained resilient. I do pray that we will be spared from future disasters. 10. I thank God to be alive and writing this blog entry now. I have never been super stressed in my life until the year 2014 came. I've been lucky to have surpassed a lot--I've also had a series of consecutive sickness: depression, hypertension, hyperacidity, gastroenteritis, rashes, dehydration and vasculitis which I never even knew I had. From the bottom of my heart (or is it hypothalamus? 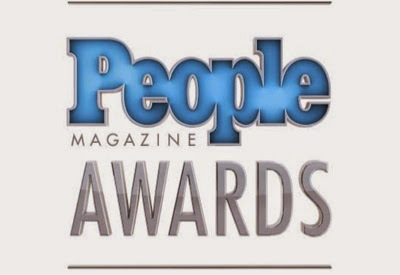 ), allow me to thank you friends, dear readers, Facebook fan page likers, contest joiners etc.--A Big Thank You! 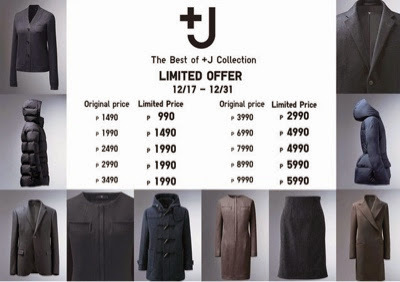 Due to the overwhelming demand from customers, UNIQLO Philippines brings back their luxurious collaboration line called +J by Jill Sander as special Holiday treat for loyal clienteles. Affordable quality wear yet timeless classic pieces, over five seasons from Fall Winter 2009, +J grew to be one of the most successful fashion collaborations to date--elevating basic garments for functional, minimalist elegance that suits any lifestyle. It is every Filipino child's dream to celebrate his or her birthday at Jollibee. And that includes The Voice Kids Philippines grand winner Lyca Gairanod. 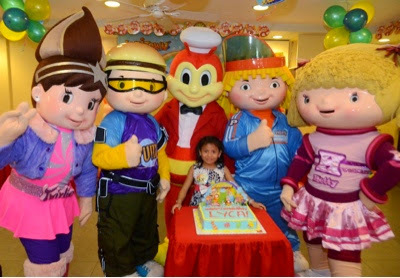 She has always wanted to have a fun-filled Jollibee kiddie party that she and her family would enjoy. 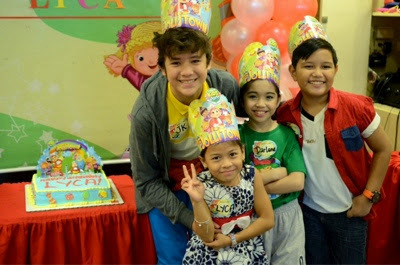 As a special gift to one of the newest Jollibee Kids Club endorsers and featured talenf in the Chickenjoy commercial, Lyca's wish was recently granted by Jollibee as they had given her one unforgettable Jollibee Kids Party for her 10th birthday. 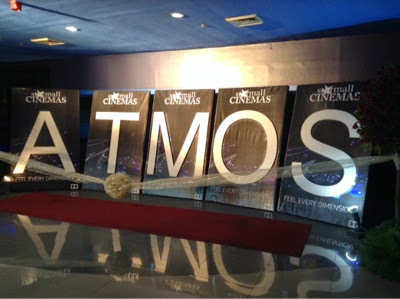 Movie buffs and cinema goers from the South had something to be happy about this holiday season as Starmall Alabang (formerly known as Metropolis Alabang) finally opens the very first Dolby Atmos cinema in the South. 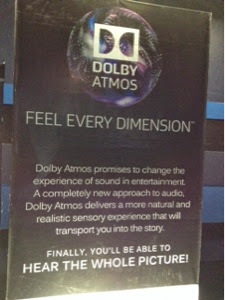 Dolby Atmos is a state-of-the-art system that changes the way you watch a film at the cinema. 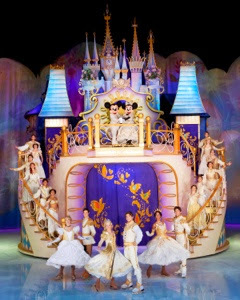 It promises viewers to experience a different sound in entertainment as it uses a completely new approaches to audio. My best friend had just gotten married recently. Now, everyone around them suddenly becomes too excited for her to conceive. People might just say something casually but somehow puts more pressure to the newlyweds. Keep in kind that the process of getting pregnant isn't always easy for everyone, and because of this, people that are tying to conceive can be sensitive about topics regarding fertility. Getting pregnant may not be as difficult as it sounds when a couple knows what to look for in trying to conceive. For women, being able to pinpoint ovulation is one of the first things to do to increase the odds of conceiving. According to Pregnancytips.org, ovulation is when the body releases the egg from the ovary and the time in a woman’s cycle where she’s fertile and ready to conceive. Ovulation can only last in about 2-3 days so being able to catch the egg will give you a boost in getting pregnant. There are several ways nowadays to track ovulation, one is by using an online fertility ovulation. These apps are available online and mobile devices. Most of these apps are free and will just ask for the first day of your last menstrual cycle and how many days your cycle. After that, the app will do the work for you. It will notify you when your next possible ovulation day is. Although these apps are very helpful, they may not be as great to those with irregular cycles. If you are having irregular period, use another tool to track your ovulation. 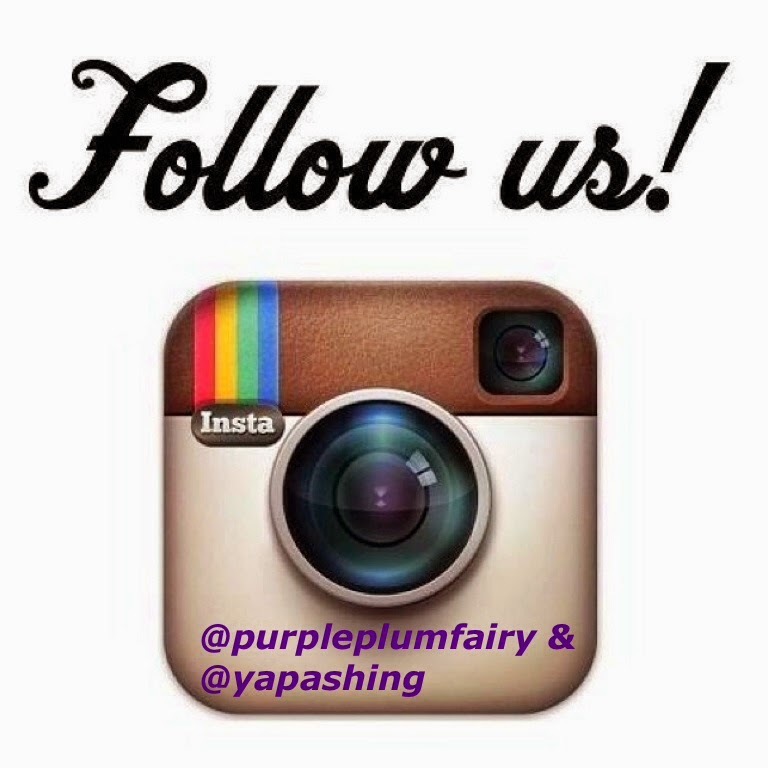 You may use an Ovulation predictor kit (OPK), a Basal body thermometer or check your cervical mucus. Visit Pregnancy Tips at http://www.pregnancytips.org to know more ways on how to track your ovulation. 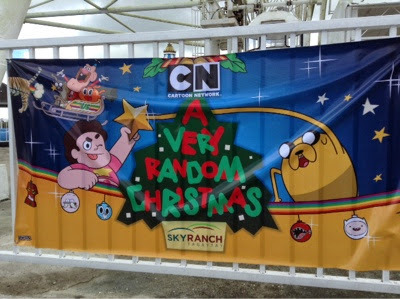 Exactly twelve days before Christmas, Kyle and I were invited by Cartoon Network, the number one kids' channel in the Philippines to an afternoon of awesome fun, games and adventure to Tagaytay with A Very Random Christmas at Sky Ranch. The said event was free admission and open to the public. 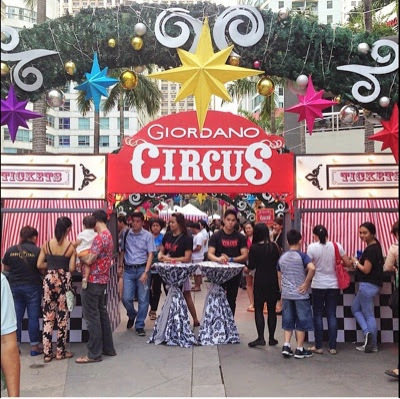 And since it was held on a weekend (December 13 and 14), families, relatives and friends were present to join in on the fun treat. 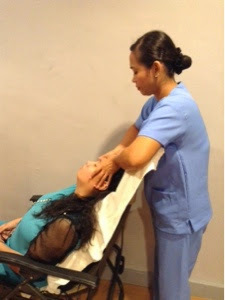 Nowadays, the Philippine medical tourism is quite in demand with the emergence of both dermatological and aesthetics clinics. It continues to thrive as a growing contributor of innovative technologies that masters not just science but the art of beauty as well. I've been to a lot of dermatological and aesthetic clinics, my experience varies from the worse services to the best treatment ever! And recently, I've been invited to try the services at Skintology Aesthetics Clinic--which is an expert in providing quality and innovative dermatological treatments for both men and women. 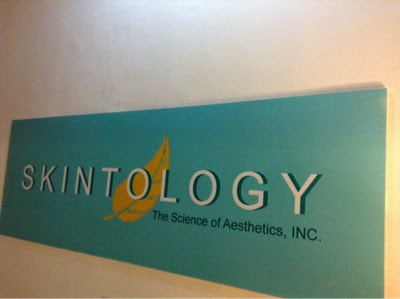 Located at the heart of the business district in Makati City, Skintology Aesthetics Clinic was established a year ago by a group of friends and it has become a reputable company among its loyal clientele. "Our drive and passion in pursuit of beauty and wellness fuelled us up to put up a clinic that offers an array of quality skin care solutions and state-of-the-art skin care technology to help give clients the best, personal experience and results," says Maia Pega, president and co-founder of Skintology Aesthetics Clinic. In this life, nobody's perfect but we all strive hard to become better versions of ourselves. 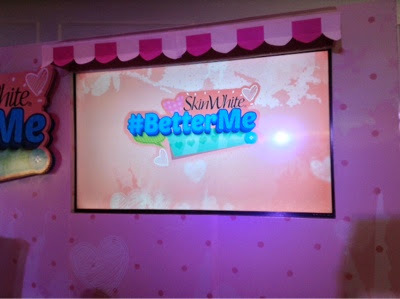 SkinWhite, the country's leading skin whitening brand encourages young Filipinas to further improve who they are both inside and out via the launch of the #BetterMe campaign which seeks to give youngsters more confidence. 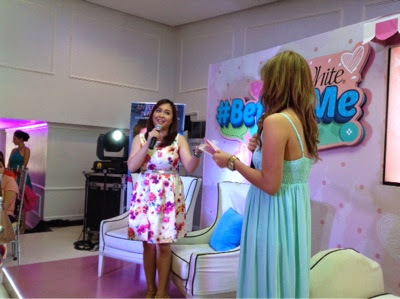 "SkinWhite's #BetterMe campaign inspires me a lot," enthuses actress and SkinWhite brand ambassador Kim Chiu during the launch held recently at R Spaces, Makati City. "It makes us girls look at the brighter side of life and thus spreads the positive vibes!," she adds. I once read that success is pretty empty when you have nobody to share it with. Generally speaking, for most Filipinos it is our family that makes us happy and complete. So it is but fitting that we provide them with a comfortable life including a place where they could just be themselves, relax, commune with nature and to simply enjoy life. Pine Suites Tagaytay is such a perfect place to invest in, live or reshape your idea of a weekend getaway. 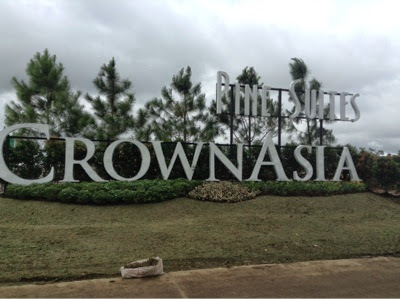 Nestled along the highest elevations of Tagaytay lies another leisure residential development from Crown Asia called Pine Suites Tagaytay--a premier residential that speaks of exclusivity and luxury. Where stunning views and a breezy cold climate come together to redefine mountain resort living. 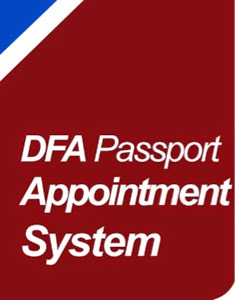 I remember those times when getting birth certificates, passports and other vital documents were so difficult. Imagine having to get up early, prepare and travel back and forth to the office where you'd have to take these necessary papers and having to endure really long queues. 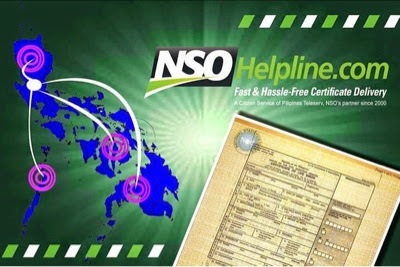 Thank God for good companies such as Pilipinas Teleserve. It is incongruous that any development is accompanied by environmental degradation. In man's quest for wealth and comforts, man would ignore Nature's law and thus disturbed a number of natural cycles resulting in environmental pollution and health hazards. 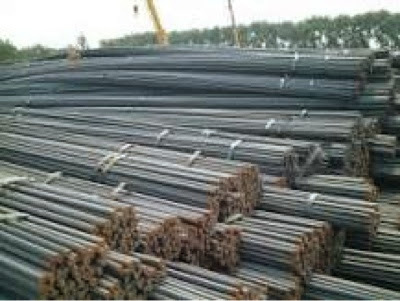 What will you do if one day a small town known for its irrigated prime agricultural land would be subjected to go against a planned construction of a rebar plant that would further lead not just plain environmental degradation but health problems as well? This my friend is exactly what's going on in Barangay Parulan, Plaridel, Bulacan. 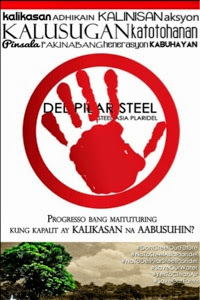 We were able to interview the leader of Kalikasang Dalisay para sa Mamamayan ng Plaridel (KADAMAY PLARIDEL) who has filed an opposition paper with the DENR regarding against Steel Asia. 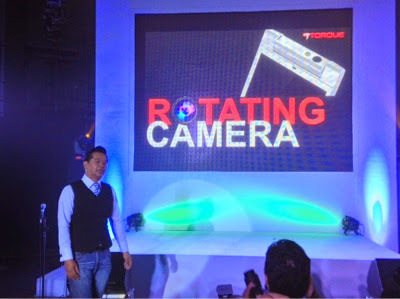 Torque recently launched their latest phone + tablets/phablets that will surely turn your world upside down! 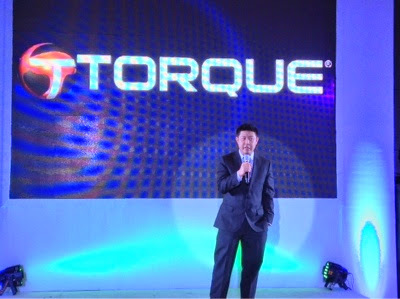 With the Christmas fast approaching, get ready to drool with Torque's new evolution of phablets: DROIDZ Swivel, DROIDZ PIVOT, DROIDZ ROTATE and DROIDZ AXIS. 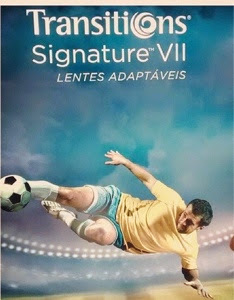 The notable feature of these amazing phablets is the Rotating camera with high-end specs to boot. The first time I saw multi-hyphenated TV host/Model/editor/columnist Bianca Gonzalez was in a Pantene Shampoo advertisement more than a decade ago. We actually had three things in common: we were both part of ABS-CBN's Concept Development Group as brainstormers where we conceptualized programs and work on scripts to be pitch in for future TV shows. And just like Bianca Gonzalez, I used to write for glossy magazine publications. I also dream of writing my own book. 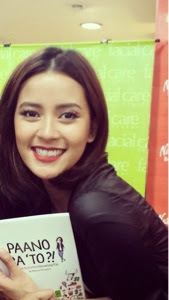 So it was nice to hear that Bianca Gonzalez dream has finally been realized. 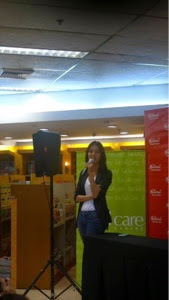 She had just recently launched her first book entitled "Paano Ba' to? 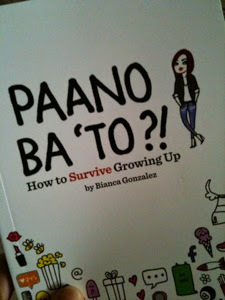 How to Survive Growing up" where Bianca Gonzalez shares her sound advices, thoughts on fashion, love, life--basically one practical guide for youngsters. 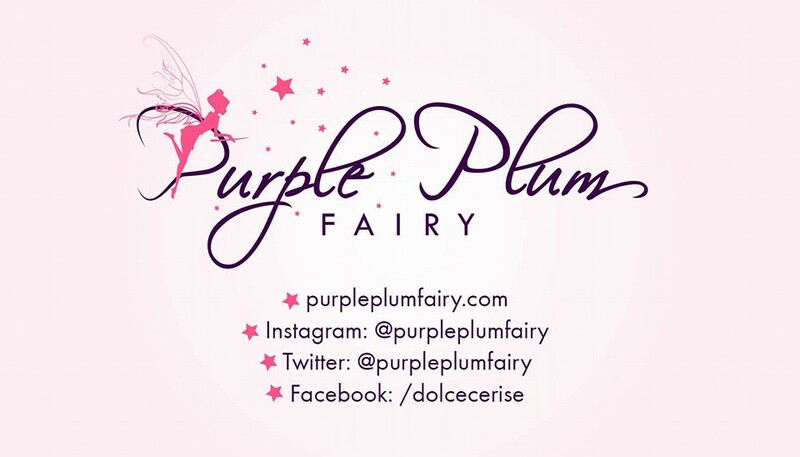 My blogger friend Melanie Medrano came to represent Purple Plum Fairy to Bianca Gonzalez' Paano Ba' to? Book How to Survive Growing Up Signing activity held at the National Book Store in Trinoma Mall. "I'm so excited and honored to share with everyone my one-year-in-the-making-dream-project-book!," Bianca enthused. 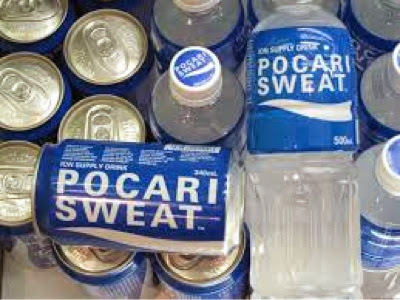 "Paano Ba' To? how to Survive Growing Up" is dedicated to every girl in their teens, 20's or even 30's with questions about how to handle issues on family, friendship, love, career, fashion, beauty, career, fashion, self-image and more. Aqua Mineral From The Dead Sea Product Review: Defy Aging + Giveaway! At the age of 30, we start to lose collagen and skin elasticity. With the numerous factors to consider such as stress, cigarettes, pollution and other harmful free radicals, the skin gets more and more saggy each time we're exposed to these (sadly, it's almost everyday that we are exposed to these things). Don't fret though, hope is still within reach. We can still defy early signs of aging but only if we use the right skin care products. Have you heard of Aqua Minerals? 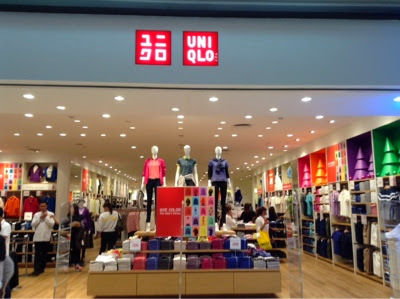 I'm sure you've probably seen them at the malls (just as I did) or must have heard about their amazing products because they've been around here in the Philippines for 6 years and had been enjoying the Asian market too in places like HongKong, Japan and Vietnam. 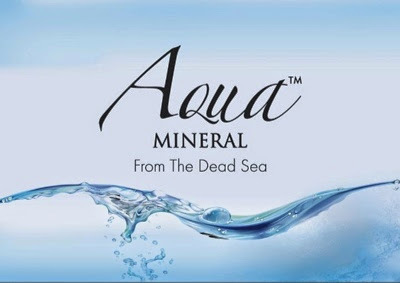 Aqua Minerals products are made from the minerals found at the Dead Sea--the same one you read from the Holy Bible, located between Israel and Jordan. 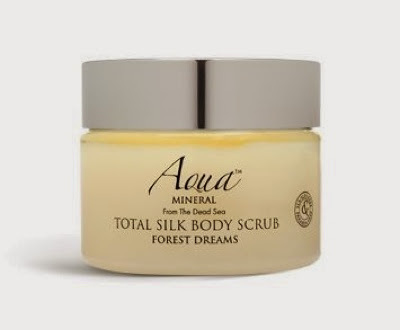 CosmetiGroup International Corporation is the exclusive distributor of Aqua Mineral Beauty Line products. Aqua Mineral beauty line combines both health and beauty benefits with its innovative, patented technology. So even upon instant application, you can feel and see the difference. It rejuvenates the skin and penetrates deeper, not just topical because the seaweed that exists in the dead sea is high in betacarotene. 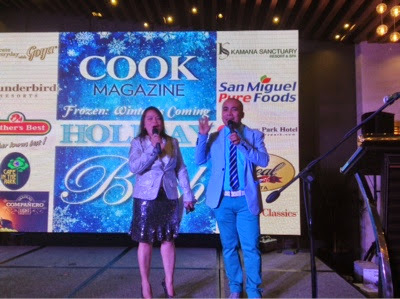 The COOK Magazine Holiday Bash is actually COOK Magazine's yearly Christmas gathering and celebration of thanksgiving to everyone who had supported them in the previous years. 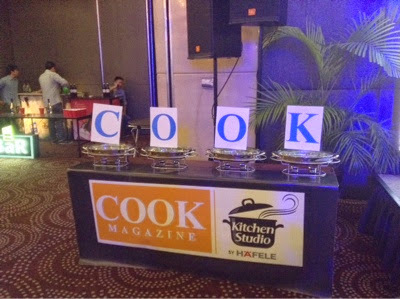 Now on their 15th year of publication, Cook Magazine continuously thank their loyal readers and supporters. 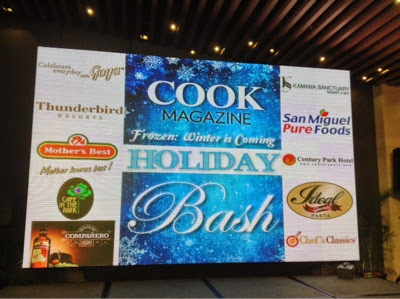 The COOK Magazine Holiday bash with its theme "Frozen: Winter is Coming" also pays tribute to their advertisers, sponsors, media friends, photographers and bloggers. 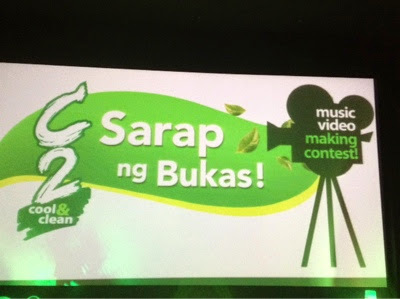 The said event were hosted by Marou Pahati Sarne of DWIZ and COOK Magazine's Advertising Sales Manager, Marlon Aldenese. Cook Magazine really had to celebrate a lot because aside from their 15th year in publication, they have also just launched their state-of-the-art Kitchen Studio recently. 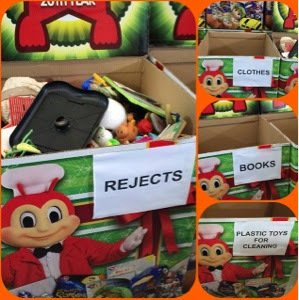 It's been a family tradition to donate pre-loved toys to the Jollibee Maaga ang Pasko Toy Drive ever since it was launched two decades ago. 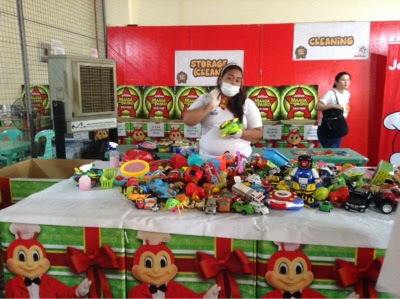 Jollibee, the leading fast food chain in the Philippines has partnered with Breeze as its official detergent for the cleaning up phase of the pre-loved toys. 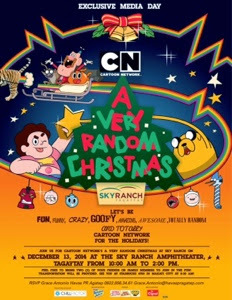 And like I've said, although I donate toys yearly to the said campaign, it's only this year that I was able to experience how it is to be a jolly toy scout. 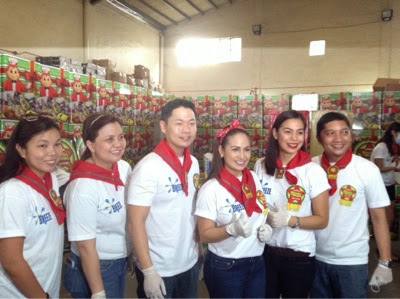 Jollibee and Breeze kicked off a series of special Laba Days in a warehouse in Mandaluyong City. They also tapped celebrity moms Regine Tolentino, Bettina Carlos and Breeze's Sige Mom Ambassador Christine Bersola-Babao along with an army of bloggers and other volunteers from both brands to work hand-in-hand to clean and prepare the donated gifts. Bioessence recently celebrated its 20th year in the beauty industry. We were one of the lucky ones who received an invite to meet and greet their newest brand ambassador, none other than America's Next Top Model Allison Harvard. I had to admit I don't know much about her except for the fact that I used to see her big bright eyes and blonde hair on her EDSA Bioessence billboard. So to be perfectly honest, I'm not really what you could call a fan. 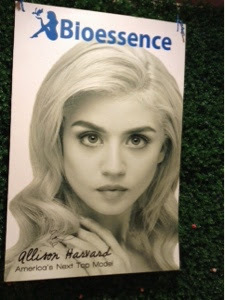 But I was surprised to find out that Allison Harvard's really charming and down-to-earth in person. 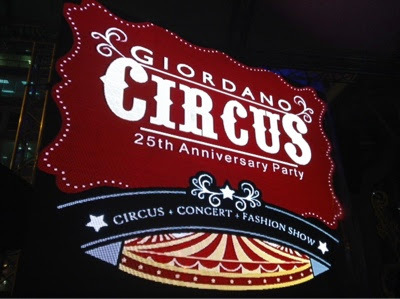 Giordano--one of the country's well-loved brands recently thanked its loyal consumers and Giordano aficionados with a free concert featuring Brownman Revival, Franco and Giordano brand ambassador and popular music icon Rico Blanco + a fashion show where they showcased the trendiest and latest styles this season via the Giordano Circus-Themed 25th Anniversary Party held at the Eastwood Mall Open Park.